Health Benefits: Organic, human grade, no GMO. Serve only as a treat or add to your own bird mixes and recipes, sparingly. Carrots can be attributed to their beta carotene and fiber content. This root vegetable is also a good source of antioxidant agents. Carrots are rich in vitamin A, Vitamin C, Vitamin K, vitamin B8, pantothenic acid, folate, potassium, iron, copper, and manganese. Certified organic, carrots, human grade. 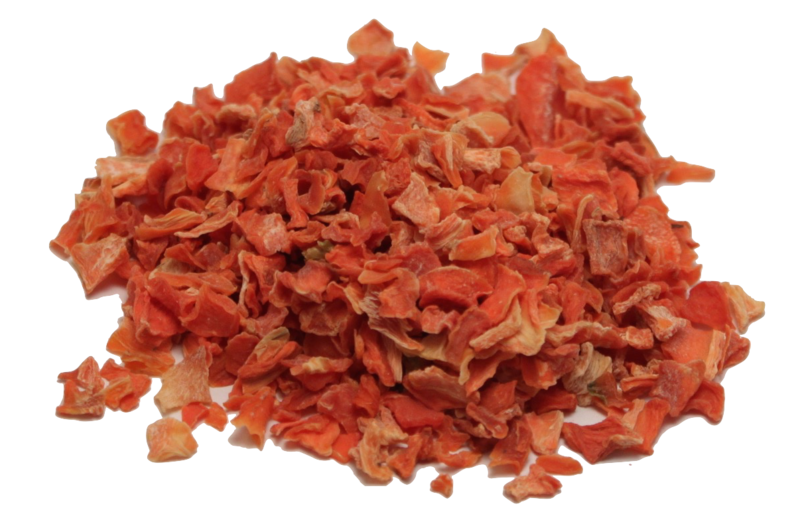 Sweet, organic, dried carrot flakes are offered in many of our mixes, for their sweet taste and colourful appearance, add to your own dry mixes, breads or mashes. Most of the benefits of carrots can be attributed to their beta carotene and fiber content. This root vegetable is also a good source of antioxidant agents. Furthermore, carrots are rich in vitamin A, Vitamin C, Vitamin K, vitamin B8, pantothenic acid, folate, potassium, iron, copper, and manganese.